Even before I moved to Oak Park and joined the Oak Park Runners Club, I was in full anticipation of being an Oak Park resident by April. 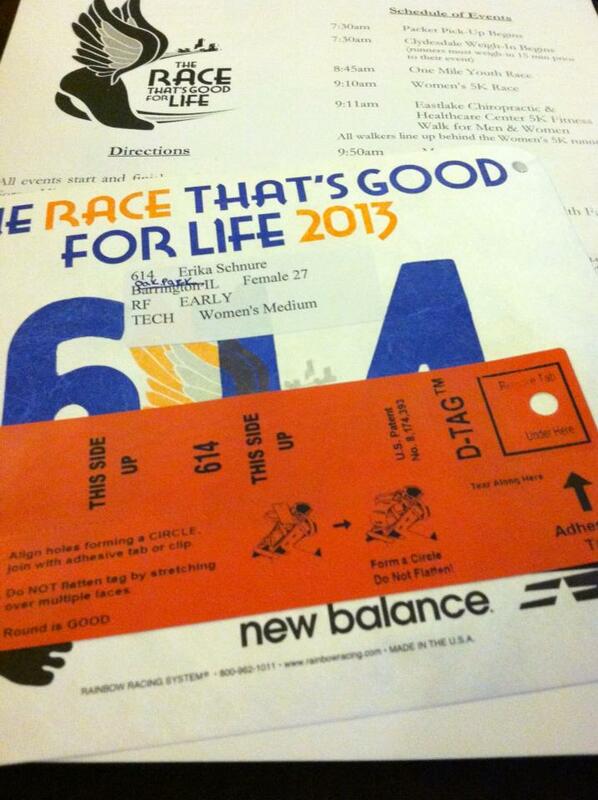 So several months ago, I signed up for the Oak Park Runners Club annual race, The Race That's Good for Life. Today was race day, and after I had pinned on my bib and laced my D-tag into my shoe, I hoofed the few blocks to Oak Park-River Forest High School (the start and finish site). After a few minutes milling about the high school halls and finding a spot to stretch, I made my way to the starting line for the women's race start at 9:10. Promptly at 9:10 the starting gun went off (yep, a real starting gun, how fun!) and we were off. It was my own mistake, but I had lined up in a bit of a poor spot. I lined up pretty far back from the starting line, and in the absence of any provided pace markers, I ended up dodging my way through slower runners for the first half mile or so. Not an ideal situation, but once I made it through the pack, it was pretty smooth sailing. 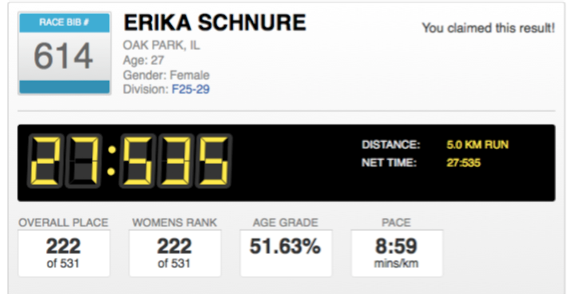 It was a fast course without much elevation change, which may account for my excellent PR of 27:53.5. The finish line was fully stocked with water, gatorade, bananas, granola bars, hummus dip packs, you name it. So the race was good, well-organized, on a picturesque course through the lovely homes of Oak Park, but the main reason I loved this race was the community. I moved to Oak Park almost a month ago now, and am still getting used to the concept that this is my home and this is my community now. Oak Park, technically speaking, is a small town -- just 4.7 square miles in area with a little less than 52,000 residents. Most neighborhood races I've run there have been some of the residents that stand on their porch, watching curiously as the runners go by. In Oak Park, people didn't just come out of their homes to idly watch the race. People were standing in their yards, sitting in lawn chairs pulled up to the curb, and cheering. I'd never been in a neighborhood race where so many residents were watching and enthusiastically clapping, cheering, ringing cowbells and holding motivational signs. Especially as we neared the finish, the sidewalks were just jammed with people cheering on their fellow Oak Park residents. It really lifted me up, and for the first time, I felt like I was really a part of this community, which was a really great feeling for me. The Race That's Good for Life is definitely a keeper for my 2014 race circuit. See my other past race results and upcoming races here. This week was difficult for me. I went through some rough patches with a few people close to me (yep, all at once) and after a conversation with my sister and a heart-to-heart with myself, I made some big realizations. When I lost weight, it wasn't just my body that changed. I changed. The way I think about situations, the way I react to hardships, and the way I approach life's difficulties is light years away from my mindset at 230 lbs. I didn't just strengthen my body. I strengthened myself. I am in control of my own destiny and I am in control of my own happiness. I was surprised at the way I reacted to a particular situation this week. I'd gone through something similar several years ago and at that time, I had just sat back, gave in and let myself be walked all over and defeated. I think back on that now, and I wonder why in the world I did that. My sister (who, like me, has a psychology degree) said that when I was heavy, she had noticed that I was often that defeatist. She saw someone who had given up. I was of the opinion that I was fat because of genetics and there was nothing I could do about it, so why try? Obviously, that attitude translated to other areas of my life. I had no confidence in myself, my job performance was in the toilet, and I saw no need to change since I thought I would fail (even before I began to try). Fast forward 92 lbs lost and a few years later to this past week. Faced with a nearly identical situation to that one that had earlier defeated me, I stood up. I faced it head on and I didn't back down. I very easily could have just given up again. With this particular situation, it would be extremely easy just to give up. But I picked the hard way. The challenging way. The way that had me fighting for what I thought was right. How did this happen? Why did I completely change my approach to the situation? Well, the weight loss transformation is not solely physical, it's also mental. Throughout my transformation, I had to dramatically alter my perception of exactly what I was capable of. When I was heavy with no confidence and no fight, I never thought I would be able to lose 92 lbs. I never thought I would have the ability to fit into a size 4 pair of jeans. But the fact that I did that translates to life situations. Since I eventually got to the point where I stopped giving up on myself and my body, I stopped giving up period. I refuse to be defeated in all aspects of my life now, not just my weight. I don't give up on my relationships with family and friends. I don't give up on challenges at work and because of that I am extremely valued by my employers. When I sometimes feel overwhelmed with how busy I often am, I don't shut down or run away. I push through, knowing I'll feel better for it. Because that's how it was when I was losing weight. Yes, it was hard, it wasn't always fun, but I pushed through, again, knowing I would be better for it. There are a lot of obvious benefits of weight loss. Your overall physical health, warding off illness and disease and so on. But one benefit that people might not think of is that mental factor. The strengthening of the mind, attitude and of the personal resolve. If anyone reading this is wanting to lose weight and you think you can't do it, well, you might think that now. But once you get going, you'll realize you can. You'll realize that not only can you lose weight and change your body, but you can also completely change your mind. What the heck does that post title mean? It means I scored my goal. On April 16, 2013, I stepped on the scale while I was getting ready for work in the morning and saw the number 139.5 staring back at me. My goal had been 140. I have beaten my goal. It was a slightly less exciting occasion than I had imagined. Maybe it's because I was tired (it is a very busy time at work now through June and I have been working at home every evening after I get home FROM work). Maybe it's because I was fully anticipating it, having reached a very close number recently and still working toward it. Maybe it's because I didn't necessarily feel any different. As far as heaviness and clothing fit go, 141.5 feels about the same as 139.5. But regardless, I reached goal, hitting under 140 for the first time since, well, as previously explained, probably some point in high school. It's crazy feeling certain parts of my body now and feeling just how muscular I am, particularly with the muscle being unimpeded by fat. I discovered just today that my obliques are absurdly taut, and I love how now I have a visible collarbone not buried by fat, and my legs are just... well, they're rock hard. So what now? Now that I've hit goal, how in the world am I to maintain? What if I gain? What if I keep losing because I don't know how to maintain? I'm going to keep running too of course. I now have 6 races between now and September (varying 5 and 10Ks) and I have no intention of stopping now. I have everything to owe to running. I couldn't imagine life without it -- it is just that important to me now. I think back to my first post on this blog in November, when I still had about 20 pounds to go to this point. Then, I said that you can do it. It remains true. 1.5 pounds. How much is that really? It's a bag of 5 medium-sized boneless chicken breasts (incidentally, my favorites). It's the current incarnation of the iPad. It's a Maine lobster. It's also how far away I am from my goal weight. I moved even closer to the city of Chicago just last week, and wasn't able to weigh myself all week because I had been so busy cleaning/unpacking, and with the massive routine changes, most of the time I'd just plain forgot. I stepped on the scale Saturday and was absolutely shocked to see the number 141.5 staring back at me. My goal weight had always been 140. I am 1.5 pounds away from goal. I suppose I shouldn't be too surprised. I hadn't been able to run much over the week (and the runs I'd managed had been pretty awful), but I had been feverishly cleaning, scrubbing, jogging around my new condo putting things away and carrying heavy objects for the last seven days. I'd also been home-cooking for about four days of the week, serving up various chicken breast dishes with rice and vegetables for myself and my boyfriend. 1.5 pounds. It was an incredibly exciting number to see, so tangible and reachable. But at the same time, there's some terror attached. What if I stall and the scale doesn't move for weeks? Even worse, what if I gain? That enticing 1.5 number would get taken away from me, and I'd be still further from where I want to be after coming so close. Even further, what happens after I reach my goal? What if I gain it back again? What if I find I'm completely unable to maintain? However, there's obviously a huge upside to being 1.5 pounds away. In all of my years of weight struggle, I have never been so close to seeing that magic goal number. In my previous weight loss attempt with Jenny, I'd gotten no closer than 35 pounds away. I can't even remember the last time I was 140 pounds. In high school, I never weighed myself regularly. Weight was not really a concern to me at the time, since as a two-sport athlete, I'd always been of a relatively healthy weight all throughout my teenage years. The last time I was 140 pounds was definitely when I was in high school, but I couldn't tell you the exact age. I haven't thought of myself as being skinny for a very long time (if ever). While the worries are still there, I know that I have changed my lifestyle so profoundly over the past 18 months that I can't see myself going back to how it was. I can't see myself going back to eating an entire box of Kraft Mac and Cheese in one sitting. I can't see myself quitting running -- especially with five races (three 5Ks and two 10Ks) all coming up within the next six months. This has been an incredible journey, losing 90 pounds. It's been incredibly difficult, but so rewarding. I've discovered amazing things about myself that have truly made me a different person. I've discovered strength in myself that I never knew existed, and that in turn has given me so much confidence and a new-found sense of self-worth, which is something money could never buy. The journey really has been life-changing -- physically and emotionally. Looking back at it now, going through a life-changing experience is a really exhilarating thing, something everyone should experience in their lives. It of course doesn't have to be weight loss, it can be anything, but the whole concept of a life-changing experience is so incredible. There's really no other word for it. I'm still going to be a ball of nerves until I hit goal, and I can't even imagine the nutty dichotomy of feelings once I do actually see 140 on that scale. It won't be long now until I see it, and I have to believe that. I've had confidence in myself through this whole process, and I can't stop being confident in my ability to accomplish this now.